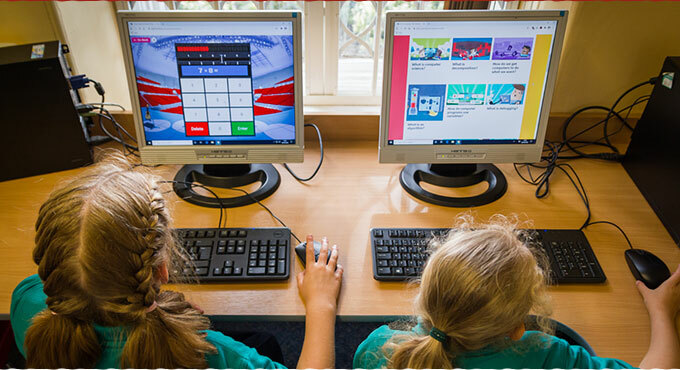 At West Bretton, we aim for our children to confidently and independently use and apply information technology skills to support and extend their learning. In addition to discrete subject teaching of specific computing skills we endeavour to use IT to support, enhance and enrich the whole school curriculum, thereby ensuring that our children are ready and able to embrace the technological advances of the future. The children are taught using interactive whiteboards and each classroom has its own computer. The children have access to 16 desktop computers situated in the computer suite and a bank of 16 iPads. Every child in school has his/her own unique username and password, which they use to access our own local network (computers in school). Our children are taught how to access information, evaluate its suitability, store it, share it with others and tailor it to meet their own needs. There is now an emphasis on learning skills for computing, including programming, debugging and exchanging information (coding). Digital Literacy is a big part of the curriculum, with children learning how to use ICT safely. All classes undertake e-safety sessions on topics such as cyberbullying or keeping information safe. We have also held parents' information sessions and shared information with parents about the potential dangers of the internet including social media and the importance of e-safety.